This week's Etsy shop is Scrap-N-Scribe. This shop has all sorts of super girly fun stuff for your little princess! This shop is so darn cute! I love all the different hair bows that she can make out of ribbon like the ballerinas and those adorable cupcakes! I never would have thought to do something so creative. There are bows for all holidays and occasions. They are super sweet, I wish I was having a little girl so I could get some of these! There's a little bit of something for every personality. There are cute little plain headbands, nice big bows, holiday themed clips, and classy flowers. She also makes bow holders, magic wands, dresses, tutus, notebooks and lots more! 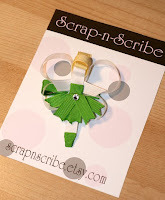 This week, Scrap-N-Scribe is offering this cute little Tinkerbell hair bow as the prize. How sweet is this? I know with the Tinkerbell movie that came out not too long ago, there are lots of little Tink fans out there. 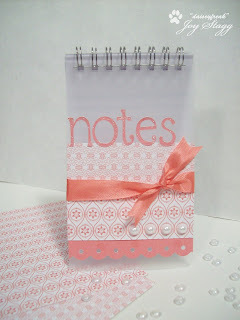 All you have to do to enter is pick a piece from the Scrap-N-Scribe shop to use as inspiration. 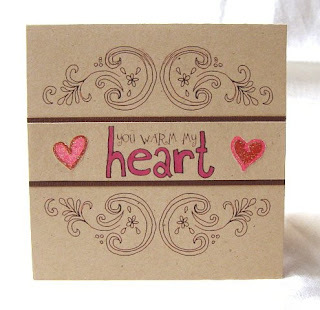 Make ANY creation that you would like (card, tag, cake, sketch, jewelry, etc...) and post a link here on this post by next Friday Feb 13 noon Pacific time. You will be entered in a random drawing to win this adorable prize! Now, go be EtsyInspired! Here is my card based on the adorable fairies and cupcakes she uses in her shop. I tried to take a picture of the Shimmerz I used on this card and they kind of show up. 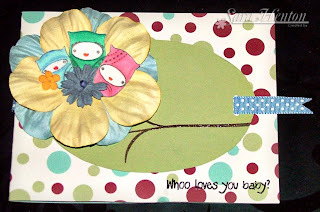 This is guest designer Sara's sweet card! I love Sara's unique style! How cute is this card with the dots, flowers, and owls? 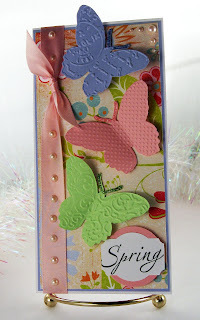 The amazing Lee made this gorgeous butterfly card. Oh, I just love it! Those embossed butterflies are gorgeous! 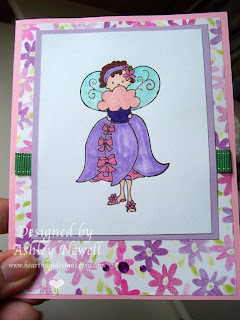 Here's Tiff's sweet girly card. Aren't those ribbons and bow so cute? What a pretty card! Joy made this adorable notebook. I'm in love with the frosted cover and the great paper and ribbon she used. In EtsyInspired news, this week we will be saying goodbye to our sweet Tanis. I could never have dreamed to have someone so talented on our team! Tanis is truly amazing but with her crazy world of stamp designing, make tons of stuff, and being overall awesome, she decided to give her spot to a new designer. Thank you so much Tanis for being with us! I have so enjoyed your work! Also, I've gotten some questions about the amazing Lindsay Spencer. Lindsay is just taking a hiatus to finish up her house and help her hubby get well after the horrible pneumonia he had. She'll be back soon. We miss her SOOOOO much! I also need to thank every single person who took time to apply for the EtsyInspired team. It was such an honor to get so many applications and it was very very hard for me to pick just four people. If I could, I'd pick all of you. If you put down that you'd be interested in a guest spot, please watch your inboxes! I have you all filed away for the upcoming months. AW, thanks so much Ashley!!! It was great!! I wish I had time to do everything I want to do...I LOVE this idea and hope it continues to grow :) It's been fun! I love your fairy card and Sarah's owl and flower card was amazing too!!! I got your e-mails from last night today sorry was not around to participate in the e-mails back and forth. This weekend was increadibly busy with a Huge Stamping Garage Sale and getting ready for some really big SU! workshops. I am going to go check out the Shop for next week so I can start working on my card tomorrow. When do our cards have to be to you???? Friday???? So so honored that you picked me I am sure you had a million talented ladies apply I see a lot of people over the web talk about your Etsy Challenge!!!! So looking forward to getting to know you and the other girls more!!! Hi! Nice challenge and beautiful DT samples. Here is my card. Thanks for looking. WOW -- Wonderful cards from all your team -- so CUTE!!! Another fun store this week! She has some CUTE stuff! hey Ashley, the DT did a great job! :) here is my card!